At GRS we have a wealth of experience and market knowledge to help you get the most from your finances. We use a tried and tested approach to ensure that we manage all of our clients’ financial affairs efficiently, responsibly and ethically. 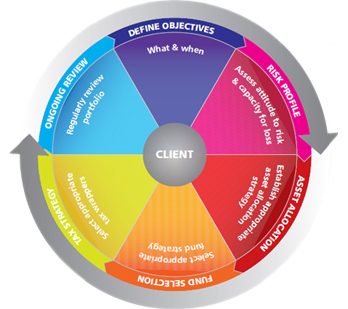 We use a structured four step process to deliver our advice proposition. Introduction to our services and advice process. We'll spend time discussing your plans, attitude to investment risk and possible solutions. If both parties agree we will begin work designing your Financial Plan. The plan will be comprehensive and detail fully our recommendations to you. It will contain the costs of implementation and ongoing review. On instruction we will implement your financial plan. We will complete all documentation and ensure that each element of your plan is set-up as recommended. If agreed, we will monitor your plan to ensure it continues to remain on track to meet your objectives. Frequency of reviews is dependant on circumstances and is by mutual agreement. Our advice process has been specifically designed so that it can be delivered in separate modules. This means that at the end of each stage you'll get the opportunity to consider your options before deciding whether to move forward. Security question: What year is it? We use a structured six step process to deliver our investment proposition. Using a disciplined and repeatable process is, we feel, the best way to achieve consistent long-term success. We will provide you with a written ‘Client Suitability Report’ when the advice process has been concluded. This is an important document and will define the purpose, objectives and measure of success for your investment portfolio. We will refer to this at your annual review meeting to judge the success or otherwise of the recommended investment. GRS Financial Consultants Ltd are authorised and regulated by the Financial Conduct Authority. Authorisation reference 198023 click here for access to the FCA Register. GRS Financial Consultants Ltd is regulated at Companies House No. 4188288.